A scientific team led by the University of Pennsylvania has received an award from the Defense Advanced Research Projects Agency (DARPA) to develop and validate reproducible methods for studying human social behavior. DARPA is an agency of the US Department of Defense that invests in breakthrough technologies to support national security. The award is part of DARPA’s new Next Generation Social Science program, or NGS2, which aims to revolutionize the speed, scale and rigor with which social science is performed. The grant provides the Penn-led, multi-disciplinary team with $2.95 million for two years, with a possible additional $2.3 million for a subsequent one-and-a-half years, dependent on progress, to further the goals of the NGS2 program, a key one being to develop a deeper understanding of the factors that drive the emergence or collapse of collective identity in human populations. Joshua B. Plotkin, a professor in the School of Arts & Sciences’ department of biology, with secondary appointments in the department of mathematics and the School of Engineering and Applied Science’s computer & information science department, will lead the project. His colleagues in the effort are Erol Akçay, an assistant professor of biology at Penn; David Rand of Yale University; Simon Levin of Princeton University; Johan Bollen of Indiana University; and Alexander Stewart of University College London. NGS2 also serves as a response to the so-called “reproducibility crisis” in the sciences, and the social sciences in particular, in which published findings have failed to be corroborated by follow-up studies. The program’s interest in applying rigorous methods to the social sciences aligns with a strategic strength of Penn Arts & Sciences, an emphasis on quantitative explorations of evolving systems. The proposal by Dr. Plotkin and colleagues will encompass three scales of methods development and experimentation. On one level, the team will use game theory and evolutionary modeling to predict what factors govern group behaviors such as cooperation. The researchers will also put game theory into action, recruiting participants to play in-lab and online games in order to test model predictions for what conditions encourage a group to act as a cohesive whole. Finally, the research team will take advantage of massive data sets from such sources as Twitter to identify how social norms and collective identities arise and change over time in the real world. Because the research involves studies on human subjects, it will be subject to IRB and human research protection offices’ review. Study subjects will be informed, and consenting volunteers and data will be de-identified to protect their privacy. The DARPA award is structured with reproducibility built in: Each of the DARPA-funded teams, after developing and testing its own models and hypotheses in the first phase of the project, will then cross-validate each other’s predictions in a second phase using its own study subjects. In addition, applying a relatively new practice in the social sciences, the researchers will pre-register all of their experimental plans in advance of performing them. This process, which requires laying out the teams’ hypotheses, protocols and planned analytical techniques, will help ensure a proper, unbiased interpretation of results. “This DARPA program will hopefully usher in a new research cycle of mechanistic modelling and hypothesis testing to make a predictive science of social phenomena,” Dr. Plotkin said. A five-month-old Cane Corso named Sidon was saved by Penn Vet’s Shelter Dog Specialty Medical Treatment Project, making him the 100th dog aided by the program since its launch in March 2015. The life-saving program is made possible through the generosity of the Richard Lichter Charity for Dogs (Almanac March 31, 2015). When a shelter dog has a medical problem that requires specialty care, shelters often do not have the resources necessary to address the animal’s needs. Experts from Penn Vet’s Shelter Medicine Program and partner facilities select dogs to enroll in the Shelter Dog Specialty Medical Treatment Project. Through this program, veterinarians at Penn Vet’s Ryan Hospital provide specialized medical care to dogs from area shelters that are in need. All diagnostic and medical services are covered free of charge to participating shelters. 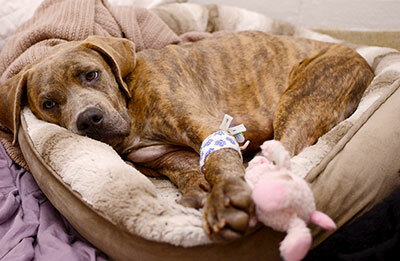 Following treatment, dogs are placed in foster homes and made available for adoption. Sidon arrived at the Pennsylvania SPCA with an extremely swollen neck and shoulder. The swelling appeared to be progressive, so he was sent to Penn Vet’s Ryan Hospital for advanced diagnostics, intensive care and possible surgery. Sidon was placed on antibiotics, which helped to lower his fever and swelling. A CT scan revealed a fluid-filled tract that spread from the base of his tongue to the thorax and the mediastinum, as well as to the shoulder blade and along the back. The extensive infection was the result of an unknown injury, most likely a penetrating foreign body. Drs. Lillian Aronson and Christine Hsueh performed surgery to debride and flush out the abnormal tissue. They also placed a closed suction drain to remove additional fluid post-surgery. Sidon recovered very well and the drain was removed after 36 hours. He is happily residing with his foster parent, Allison Vetter, one of the nurses who cared for him at Ryan Hospital. “I tell everyone how wonderful the Shelter Dog Specialty Medical Treatment Program is. It makes a big difference for dogs who wouldn’t otherwise have a second chance at life. I have high hopes for Sidon,” said Ms. Vetter. We are united for justice and solidarity. We are united against hatred, discrimination and intimidation. I just want to say how proud I am of how many people came out. I think that even more would have come out if we had more notice, but this is an amazing turnout. We are in solidarity. We will continue to work together, because in unity there really is strength. I believe that the arch of the universe bends towards justice, only not fast enough. We will work to make it happen. I just want to thank you very much for coming out and making us all proud to be members of this community. I am glad that we are in solidarity. We are united against hatred. We are united for our Black sisters and brothers. We are united for our Muslim sisters and brothers. We are united for our LGBTQ sisters and brothers. And we are united for Jews, and Muslims, and Christians, and Buddhists, and Atheists and everybody else regardless of their religion or political ideology. We are united with anyone who wants to join the cause of justice and inclusion. Higher education matters and we at Penn want to show how much it matters. We are united in respect of all persons. We are united against discrimination. May the word spread throughout the land that respect for everybody is what Penn stands for. Education is about respect for everyone and inclusion. We are united in making this community, our society and the world better, and I couldn’t be more proud to be your president. Thank you all so very much. Peter H. Berman, senior neurologist at Children’s Hospital of Philadelphia and a professor emeritus at the Perelman School of Medicine at the University of Pennsylvania, died on September 1. He was 84. Dr. Berman was born in Vienna, Austria and fled the Nazi regime to London before emigrating to the Upper West Side of New York City. He earned his medical degree at New York University College of Medicine and completed an internship in pediatrics at Bellevue Hospital, New York City, followed by a residency in pediatrics at the University of Minnesota Hospital, Minneapolis. Dr. Berman’s work focused on clinical child neurology and pediatric epilepsy. He joined Penn in 1969 as an associate professor of pediatrics and neurology. He then became a professor of pediatrics and neurology in 1979 and held that role until 2011, when he retired and became professor emeritus of neurology. He continued to work at CHOP until his death. He was recognized in the second edition of The Best Doctors in America published by Woodward/White Inc. in 1994 (Almanac April 12, 1994). He published writings on neurology and pediatrics. Dr. Berman served as president of the Child Neurology Society from 1991-1993 and received the Society’s highest honor, the Hower Award, in 2003 (Almanac March 18, 2003). He is survived by his wife, Lynne; children, John, Elizabeth and Michael; six grandchildren; and four nieces and nephews. Donations may be made to the Philadelphia School, c/o Genvieve Goldstein, Associate Director of Development, 2501 Lombard St., Philadelphia 19146. Ludo Rocher, Emeritus W. Norman Brown Professor of South Asia Studies, died October 31. He was 90 years old. Throughout his career, Dr. Rocher was renowned for being the most active Sanskrit scholar in the United States and a world authority on classical Hindu legal cultures. Dr. Rocher was born in Antwerp, Belgium. He attended the University of Ghent, where he earned an MA in classics with a minor in Sanskrit in 1948; a JD in 1950; and a PhD in Indic studies in 1952. He also studied at the University of Utrecht and the University of London. Dr. Rocher was a professor of Sanskrit and comparative philology at the University of Brussels from 1959-1967 and became director for the Center for the Study of South and Southeast Asia in 1961. In 1965, Dr. Rocher became the first non-Africanist to be elected to the Belgian Royal Academy of Overseas Sciences. Prior to his appointments at the University of Brussels, he was a Research Fellow at the Belgian National Foundation for Scientific Research from 1952-1958. In 1966, Dr. Rocher was invited to Philadelphia by W. Norman Brown, an eminent scholar of Sanskrit and Indology at the University of Pennsylvania. Dr. Rocher was appointed professor of Sanskrit at Penn’s department of Oriental studies (which became the department of Asian and Middle Eastern studies in 1992). Dr. Rocher served as the chair of the department of Oriental studies from 1967-1975 and again from 1988-1994. He also spent time as chair of the department of South Asia regional studies and director of the National Resource Center for South Asia Studies from 1975-1979. In 2002, he retired and became professor emeritus of South Asia studies. Throughout his career, Dr. Rocher authored almost 20 major books and hundreds of articles and reviews. Notable works include The Purāṇas, Jīmūtavāhana’s Dāyabhāga: the Hindu law of inheritance in Bengal, and Studies in Hindu law and Dharmaśāstra. He received many prestigious grants during his time at the University of Pennsylvania including a Fulbright-Hays Research Grant in 1969, a NEH Translation Grant in 1986 and a grant from the American Institute of Indian Studies in 1994. He also received the Lindback Award for Distinguished Teaching in 1986 (Almanac April 15, 1986). As an eminent scholar and expert in the field of South Asian regional studies, Dr. Rocher held many posts; he was elected vice president of the American Oriental Society from 1984 to 1985, and president from 1985 to 1986. Dr. Rocher also was elected vice president of the American Institute of Indian Studies from 1981 to 1983, and served as Chairman to the Board of Trustees from 1984 to 1985. He was a Fellow of the Asiatic Society and a member of the American Philosophical Society, the Association for Asian Studies, the Royal Asiatic Society of Great Britain and Ireland, the Bhandarkar Oriental Research Institute, the Vishveshvaranand Vedic Research Institute and the Kuppuswami Sastri Research Institute. He is survived by his wife, Rosane. On behalf of the Standing Faculty of the University of Pennsylvania, the Faculty Senate Executive Committee endorses the “Statement from Penn President Amy Gutmann About the Presidential Election” and the “Statement from the University of Pennsylvania Regarding Racist Messages Sent to Students.” As a faculty, we stand in solidarity with our Black students, faculty and staff, and all who are feeling targeted, unsafe, and vulnerable. We condemn racism and bigotry on and off our campus, and we are firmly committed to the advancement of equity, inclusiveness, and constructive dialogue on our campus and to ensuring that all persons are treated with dignity and respect. We commit to addressing the bigotry that has been on display in the election cycle and making our campus a safe environment for everyone. Adopted by the Senate Executive Committee at its meeting on November 16, 2016. Chair’s Report. Faculty Senate Chair Laura Perna did not provide a report but requested that SEC begin its meeting with new business. New business: Consideration of a statement responding to racist statements sent to Black Penn students. A draft statement was circulated by email to SEC members prior to the meeting. Following a discussion, a modified statement was called to question and approved (25 in favor, none against, and four abstentions). Professor Perna invited SEC members to participate in the Walk of Solidarity for the Penn community, organized in opposition to racist messages targeted at Black Penn students, immediately following the meeting’s conclusion. Past-Chair’s Report. Faculty Senate Past Chair Reed Pyeritz reported that the Academic Planning and Budget Committee and Capital Council continued to meet and that the Campaign for Community Steering Committee is planned to meet on November 29. Discussion and vote on proposed amendment to GSE Practice Professor Track. The Senate Committee on Faculty and the Academic Mission (SCOF) reviewed and unanimously approved a proposal from the Graduate School of Education (GSE) that seeks to eliminate the two-term limit for the positions of Practice Professor and Associate Practice Professor in that school. Following discussion, SEC members voted unanimously to approve the proposal. Discussion on the Role and Representation of the “Non-Standing Faculty” at Penn. Because of time constraints, the discussion was postponed to a future SEC meeting. Update from the Office of the Provost. Provost Vincent Price began by reinforcing the commitment of his office to supporting Penn students in challenges they are experiencing following the recent national election. He then reported on a number of ongoing activities. The Campaign for Community is continuing to accept applications and he encouraged faculty to submit proposals for programming aimed at fostering an inclusive community at Penn. The final report on the Action Plan for Faculty Diversity and Excellence will be released in spring 2017. A recent gift from Keith and Kathy Sachs will launch an arts innovation program that provides support to integrate arts programming at Penn in a variety of manners. A Task Force was recently launched that aims to promote a healthy and respectful campus environment. A new space in Van Pelt Library will open in January that will house the Weingarten Learning Resource Center, the Center for Learning Analytics and the Center for Teaching and Learning, among others. He described ongoing work by the Perry World House, Penn Center for Innovation, Pennovation Works and the Pennovation Center. He then responded to questions from SEC members. 2017 Senate Nominating Committee. SEC members voted to adopt a membership slate for the 2017 Senate Nominating Committee. The slate is published in this issue of Almanac for comment. 3-5 p.m., Department of Public Safety–4040 Chestnut St.
2. Pursuant to the Bylaws, additional nominations may be submitted by petition containing at least 25 signed names and the signed approval of the candidate. All such petitions must be received by December 6, 2016. If no additional nominations are received, the slate nominated by the Executive Committee will be declared elected. If additional nominations are received, a mail ballot will be distributed to the Faculty Senate membership. Please forward any nominations by petition via intramural mail to the Faculty Senate, Box 9 College Hall/6303. Please forward any questions to Patrick Walsh by email at senate@pobox.upenn.edu or by telephone at (215) 898-6943. This presentation is an edited transcript from the State of the University at the November 9 University Council meeting. The first part of this presentation is to introduce members of my senior team. I hope today to share a little bit more about how we approach our work, how we think about our work and how we reach out to achieve the type of educational community that we all strive for at Penn. Kathryn Bezella has joined the office for the second time. Kathryn heads up our marketing and communications outreach; she has been at Penn for a number of years from undergraduate admissions as well as at the Wharton School in MBA Admissions and in the Vice Dean’s Office. Kathryn has a graduate degree from Penn and an undergraduate degree from Barnard College. Lou Metzger is our head of information and management systems. When you think about the kind of work we do, you need to have that infrastructure backbone – the hardware, the software, the data capabilities in order to do the type of work that you need to do. He has an undergraduate and a graduate degree from Penn Engineering. Yvonne Romero Da Silva came into the Penn Admissions office about four years ago and is our Director of Admissions. Much of the work that you are going to see today was really the work of Yvonne and the team that supported her in that work when we thought about how to bring this office to best serve the needs of the institution. She is an educator who had admissions experience at MIT as well as at the College Board in strategic planning, and an undergraduate degree from MIT, and a graduate degree from Harvard, and an MBA from Stanford, and she is currently getting her doctoral degree from GSE. Yvonne is a leader and an educator. I couldn’t be more proud of my three senior leaders and the rest of the individuals who are in the Office of Admissions. It was 2012 when Yvonne was hired. I said, “Okay, you have eight months to come up with a strategic plan.” And she said “Yes.” And we worked together, we carved out time, about 20% of the time. You might think, “Well how can you have a strategic planning process with all the heavy work that you have in front of you?” And for students and faculty, we know that we need to carve out that time. We assembled the team that 20% of their time would be devoted to this strategy project. From that, and any of you who have done strategy projects before like Yvonne, you will see that we were taking a look at four different areas. 1) The Current State Analysis: where was Penn admissions in 2012? How were we configured? What are the challenges that we have? How do we organize our resources and support from the Provost’s office? 2) The Market Analysis, which was very interesting because it was really about looking at the world’s high school students and graduates of secondary schools, what is the potential to become a Penn applicant and to succeed at Penn. That is very different than looking at who gets in and what that admitted student profile looks like. We had to look more broadly because, as you will see later, the world was shifting and we wanted to make sure that if there was a young person of promise in the country and around the world, we would be able to consider them and know who they are and share information about Penn. 3) Competitive Landscape: Our peer groups. Our most immediate peer groups perhaps in the Ivy League and the Ivy Plus Schools, as we refer to them, or the Consortium of Financing Higher Education. Particularly, since this was happening four years after the economic collapse, the competitive landscape was changing. Institutions that are two-year colleges will become part of the competitive landscape. Great land-grant universities are part of the competitive landscape. 4) Constituent Needs Analysis: What’s critical about this is that Penn is a complex place. And as we were thinking about the needs of the four undergraduate schools that we serve, the coordinated dual degrees, thinking about our campus partners, both academic and non-academic. We wanted to make sure that we were looking out to have an understanding of how our work would impact those individuals and those programs. This is what came from that project. I am not usually into wordy mission statements but there are a few pieces here that I think are critical to resonate with. We are really talking about students as inspiring, promising candidates. This isn’t just recruitment and sending letters out. Some of the work we are doing with Penn First is thinking about students to reach out to so that they can see a Penn education as being possible. So inspiring students is very different from recruitment and maybe some of our other outreach. Through identifying the next generation of Penn Alumni. You have four short years here as an undergraduate and then you enter this larger body of Penn Alumni. There are a lot of steps in between. Making sure that we are retaining students from freshmen to sophomore year and making sure that they are graduating at high rates — four, five, six years out. There is this continuum and I think that is important for an office of admissions to recognize that it is not just our responsibility to admit a class, hand it off and then go on. Our work doesn’t end at Convocation. We feel very much a part of the campus community. This is about the individuals for whom we want to make sure that this is an educational experience, and then for the staff, we have a professional culture of support, which we felt more strongly today than we ever needed to feel in quite some time coming together in a staff meeting this morning. Connecting the statement into the areas of work that we have. You see the six bullets and I will touch on a few of them. We wanted to make sure that we had time to be able to balance all of these pieces. Recruitment might be what you expect an undergraduate admissions office to do. We are responsible for promoting the type of educational opportunity that the University of Pennsylvania can offer. That happens in a lot of different ways. For the students here, you know what a lot of them are because your inbox got filled or maybe you saw us at an Experience Penn event travelling around the globe. Maybe you came to visit campus. Brand and perception is the work that Kathryn Bezella is responsible for, really recognizing where Penn is. How people think about Penn, maybe some of the statements that the students made today as well and how that resonates with students. How competitive is the Penn campus? How inclusive is the Penn campus? What does this look like? What are people’s perceptions of who we are? Evaluation and selection is the work that we are doing right now. We just selected the QuestBridge class, and we sent those over to the financial aid office to start the QuestBridge match process. And so that is the beginning of this class. It starts even before early decision. You might have seen in the Daily Pennsylvanian that we have just over 6,000 applications for early decision. But how we configure our office to fairly and equitably review each application is critical for us. Through the strategy project we have shown that there is a different way of doing admissions. We have shared that expertise with some other schools. How we can review applications in what we call committee-based evaluation. Data and Systems: In the eight years that I have been here I have already seen three iterations of a computer system to support the work that we do. That is how fast the technology is moving and how important it is in Lou Metzger’s role that we are able to support that critical infrastructure for our work. Partnerships: Our undergraduate schools, the coordinated dual degrees, those individuals that help us not only recruit the class and yield the class but also evaluate and select the class. And so we meet with this group on a monthly basis. Beth Downing in my office heads up this effort. Cultures and Values: That goes back to what we believe in as an office. That goes to the mission statement. But that goes to the professionalism in our office. How we want to comport ourselves and how we want to support the individuals that are doing this hard work on behalf of the University. I came back to Penn for Penn admissions in 2008, when Dr. Gutmann called and hired me to come back. Now in some ways I think if I looked at that chart then, I am not sure what my answer would have been because what we have here are projections of high school graduates in 2008 through the strategy project 2012, 2013. So you’re seeing a decline. That’s what we see here through 2027. These are projections of high school graduates from The Western Interstate Commission for Higher Education. But this was the work that the analysis that the strategy project really took a look at: what’s going to happen as there’s kind of a slow and steady growth, but then also you are going to see that there are some dips as well. But even more so than this, it’s what the country was really looking like. Here you have Caucasians or white students in the blue, you have Hispanic students going up to 2027-2028, you see as this adds up to 100%, just the proportion of what the nation looks like through high school projections. I brought this up to the trustees back in 2008. As the composition of US public high schools, graduating is increasingly diverse. Our core markets declining, the population growth is going into the south and the southwest and partly to the west. So that’s very different outreach and recruitment in the type of work that you need to do if you are thinking that your home base isn’t going to have as many high school students and those individuals who are making decisions about going further away from home and having those conversations, those are the types of shifts that are taking place. You’re also seeing a decrease by about 30% from non-public high schools. So part of the market research that took place was among guidance counselors. We really needed to find out, we couldn’t just assume that everyone knew who we are as an institution. Now we do have a very strong brand position, we do have a strong market position. As I showed you before that in those areas that are going to have more students, that perception isn’t as strong. By percentage of students qualifying for free and reduced lunch, with the Compact and then the Compact 2020, how are we going to continue to make sure that we are reaching out and being as inclusive as possible? Here is a lot of your QuestBridge population, and a lot of your first-generation/low-income students. Then by the percentage of students attending a four-year college and then taking a look at what their perceptions are. More students going to a four-year college, the more people know about Penn. Fewer people going to a four-year college within a high school, with 73% or less than 50% is still pretty high, there’s a big gap there, whether you’re taking 30% of even less than 10%. So here’s the challenge that we really saw. How did we approach this? We are really thinking about how we could be a recruitment-driven admissions office. Most admissions offices are built around the concept that you create regions because it’s going to add up to about 1,200 applications and that is the assignment [of] each admissions officer. You would hear people say that you have bits of New York and Iowa and parts of some other smaller state, let’s say. Versus organizing ourselves around these larger macro regions and having a team of about six admissions officers, both domestically and globally be responsible for a larger geographic area. And this was great work that came from the strategy project to really think about what do we need to know about students where these shifts are taking place. What are their needs? What is on their mind as they are thinking about college choices? So how we would plan our recruitment. How we would measure our effectiveness. Thinking about how we are selecting students from different educational systems. Schools that may not have AP and IB as an example. And then benchmarking to national trends, whether it’s from IPEDS or from The Western Interstate Commission for Higher Education. To meet the needs of students, there are multiple facets to all of us and we really want to make sure that students are having their interests met and at different times during the recruitment continuum you are going to try and meet those interests and needs that they have. Academic achievement. The faculty want to have students in the classroom who are going to challenge them just as much as they are going to challenge the students. Academic interests. Four undergraduate schools and five coordinated dual degrees. Just the number of major-minor combinations that you can have here. Socioeconomic diversity. I know something that President Gutmann is most proud about is talking about First Gen outreach and really thinking about that socioeconomic diversity. Now something great happened that I should have pointed to back in 2008. And that was the beginning of our grant-based financial aid policies for all of our undergraduate students who qualify for financial aid. That came as a great opportunity for us to be able to talk about not only in our recruitment but also what families were facing, because of the financial crisis. Race and ethnicity. What are the needs of students? What are the needs of families as they are taking a look at going to a four-year college that may be an airplane ride away? What are the barriers that we need to consider? How can we reach out to the students? How can we make sure that they are succeeding and thriving here? And how can we really make sure that they understand what Penn is like? Geographic. Again there are going to be nuances there but these pieces may come together very strongly for some students. Maybe one or two are going to be the dominant considerations as they are considering where they are going to apply to college. So engagements on campus and beyond. What we have really found and through the support that we have, we want to bring students to our campus as early as we can. The Penn Early Exploration Program—we have been bringing students to campus in the fall over the past couple of years to stay overnight in our college houses to visit classes and you should see the shift in perceptions. These are high school seniors nationally and some international students as well who are coming to Penn. We are somewhat on their radar. But by the time that they go through this multi-day and -night event on our campus, they are more inclined to not only apply to Penn but maybe even apply to us early decision. A group of these students were thinking about applying early decision to another institution and after this they are applying to us early decision and when we have panels with our cultural resource centers and with the student support resources, we are making this place much more attainable, not only for the application process but I think even more important for the transition. Ivy in Your Backyard is reaching out to our Philadelphia community. For so many students, even if they are only a few blocks away from our campus, we may seem thousands of miles away. To let students know that they have this type of institution in their backyard and that this should be an option to consider. I am really proud because I spoke before about the perception of guidance counselors and Penn, our community-based outreach and counselor connection outreach. Counselor connections are for individuals that work within schools that we bring to campus. Your guidance counselors bring them to campus usually from within regional groups that they can come and visit us and have a couple days on our campus. Visit with some of their students who are currently students here and get a better sense of the type of atmosphere that we have on our campus. The community-based organizations, when we started this a couple years ago the date of the third week of August was proposed. I said, “Okay, I’m all for it.” Are people really going to come in the third week of August? They are so busy, maybe just transferring back into the school year. Over the past couple years we have had close to 50 in each year, directors of community-based organizations, some national ones like KIPP (Knowledge is Power Program), which we have a partnership with, some smaller ones like College Track, which has a couple of sites across the US and Chicago Scholars. We are actively reaching out, not just to school-based educators but to educators who are providing the after-school programming for students, the weekend tutoring for students, SAT and ACT prep, these are the individuals who are trusted individuals for many students to say. How do I apply? How will I feel at this institution? Penn offers counseling guidance. This is about Ivy in Your Backyard. When the cuts were happening in the Philadelphia School District, we made sure that we reached out as a partner in the local community. We had the Alumni Interview Program talk about how to interview for college. We had Kelly Writers House talk about how to write college essays. Quaker Days are our yield events. We received the Models of Excellence Award, so I am really happy about being recognized for that work. Now I know that this a public meeting and that this is being shared. I usually don’t like sharing information like this, but it is all public information and we aggregated it together. Believe me, you have to stand on your own, but in a market you need to also show where you are relatively positioned. Now applications from 2008-2011 were 22,000, 26,000, then up to 31,000. You hit the strategy project and this is where our work has gone and we are close to 40,000 applications from about 31,000 applications prior to that. This is because of our outreach. This isn’t trying to get more applicants but to be more selective. We have also seen about 50% growth in our underrepresented minority applications as well from that time period. You can see from 2013 and up. And the Penn Alumni Interview Program. We have reached about 93-94% of our applicants in 2016. This is an investment by the Penn Alumni Office and Penn Admissions that every student gets interviewed. This is a critical outreach. If we want to think about how students can tell their story. Finally, our key priorities for 2016-2017. Some of these are ongoing. When we really think about the types of messages that are important to the groups that we are reaching out to. What’s the Penn story? Our visitors’ center experience: we have about 70,000 each year through College Hall. How can we make sure they are having the best experience possible? Our international recruitment. How do we set priorities abroad, particularly for financial aid that is not need-blind on the international front but still is all grant-based financial aid once a student qualifies? Counselor engagement, we touched on that already. And our ongoing equity and access initiatives which look back right into the Compact 2020. 1. No instructor may hold a final examination nor require the submission of a take-home final exam except during the period in which final examinations are scheduled; when necessary, exceptions to this policy may be granted for postponed examinations (see 3 and 4 below). No final examinations may be scheduled during the last week of classes or on reading days. 2. No student may be required to take more than two final examinations on any calendar day during the period in which final examinations are scheduled. If more than two are scheduled, the student may postpone the middle exam. If a take-home final exam is due on a day when two final examinations are scheduled, the take-home exam shall be postponed by one day. 3. Examinations that are postponed because of conflicts with other examinations, or because more than two examinations are scheduled on the same day, may be taken at another time during the final examinations period if the faculty member and student can agree on that time. Otherwise, they must be taken during the official period for postponed examinations. 4. Examinations that are postponed because of illness, a death in the family, for religious observance or some other unusual event may be taken only during the official periods: the first week of the spring and fall semesters. Students must obtain permission from their Dean’s office to take a postponed exam. Instructors in all courses must be willing to offer a make-up examination to all students who are excused from the final examination. 5. No instructor may change the time or date of a final exam without permission from the appropriate Dean. 6. No instructor may increase the time allowed for a final exam beyond the scheduled two hours without permission from the appropriate Dean. 7. No classes or required class activities may be held during the reading period. 8. The first examination of the day begins at 9 a.m. and the last examination concludes by 8 p.m. There will be one hour between exam time blocks. 9. All students must be allowed to see their final examination. Exams should be available as soon as possible after being graded with access ensured for a period of at least one regular semester after the exam has been given. To help protect student privacy, a student should have access only to his or her own exam and not the exams of other students. Therefore, for example, it is not permissible to leave student exams (or grades or papers) in publicly accessible areas. 10. Students may not be asked for their Social Security numbers. Instructors may not publicly display a student’s Penn ID or any portion of the Social Security number, nor use names, initials or any personally identifiable information to post grades. Even when an identifier is masked or absent, grades may not be posted in alphabetical order, to protect student privacy. 11. Final exams for College of Liberal and Professional Studies (LPS) courses must be given on the regular class meeting night during the week of final examinations. No change in scheduling is permitted without unanimous consent of all students in the class and the director of LPS. LPS final exams may not be administered during the last week of class or on a reading day. In all matters relating to final exams, students with questions should first consult with their Dean’s offices. Faculty wishing to seek exceptions to the rules also should consult with their Dean’s offices. Finally, the Council of Undergraduate Deans and SCUE urge instructors to see that all examinations are actively proctored. Download the AT PENN calendar as a PDF. 28 Cider Monday; enjoy hot cider and holiday treats while celebrating the season with a Holiday Giveaway; with any purchase of $50 or more, you will receive a free Everyman’s Library book of your choice; noon; Penn Book Center (Penn Book Center). Experience diverse art, artifacts and cultures at the Arthur Ross Gallery with exhibitions, programs, concerts, special symposia, community outreach and more. Benefits of becoming a Friend include advance notice of exhibition openings and lectures, invitations to Friends’ openings, behind-the-scenes insights and happenings via e-newsletter, free admission to film series for selected exhibitions and discounts on symposium and publications. Membership levels range from $25-$10,000. Information: http://arthurrossgallery.org/join-support/become-a-friend/ or (215) 898-2083. Botanical Beauty: Morris Arboretum offers great holiday gifts. Members of the Morris Arboretum, Penn’s official arboretum, receive free admission all year long; a 10% discount in their Shop and Café and discounts on educational classes and excursions; Seasons newsletter; admission privileges to over 300 gardens and arboreta through the American Horticulture Society Reciprocal Admissions Program; discounts for local garden centers and much more. For the favorite gardener on your list, the Arboretum Shop has garden tools, garden-inspired home items, toys and books for kids and gardening books for the professional and amateur. Memberships range from $65-$2,500 and can be purchased in the Shop, online at http://www.business-services.upenn.edu/arboretum/membership.shtml or by calling (215) 247-5777. Feeling Fit: The Penn Ice Rink at the Class of 1923 Arena offers a discount book of 10 admission passes to any of its public skating sessions for $35 with a PennCard or $45 for the public. 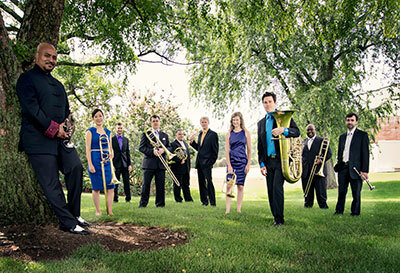 The Rodney Marsalis Philadelphia Big Brass will bring a jazzy celebration to the Annenberg Center on December 9. The Morris Arboretum’s Holiday Garden Railway—free with regular admission. Display is open daily November 25-December 31, 10 a.m.-4 p.m. (closed December 24 & 25). Holiday Garden Railway Grand Opening—Saturday, November 26, 1-3 p.m. Come see the Holiday Garden Railway dressed in its wintry finest and enjoy a fun craft for the kids. Free with garden admission. Holiday Wreath—Saturday, December 3. Create a wreath from fresh boughs of greens; 10:30 a.m.-12:30 p.m.; $50, $45/members. Holiday Tabletop Tree with Lights—Monday, December 12. Design your own tree from long-lasting greens and decorate with bows, glass balls, fresh flowers and lights; 10:30 a.m.-1 p.m.; $65, $55/members. Create a Beautiful Holiday Arrangement for Table or Mantle—Sunday, December 18. Design a one-of-a-kind arrangement with greens, flowers, branches, candles and accessories; 1-3 p.m.; $60, $50/members. The Penn Ice Rink will host two Holiday Skate events at the Class of 1923 Arena on Sunday, December 11 and Sunday, December 18 from 1-2 p.m. Admission is free with the donation of a new toy for Toys for Tots. Saturday, December 3. A winter tradition: the Penn Glee Club will return to Morris Arboretum for their annual holiday concert with hot cocoa and cookies in the garden; 2-3 p.m.; free with admission. An All-Star Christmas—Sunday, December 4. Featuring Jimmy McFadden, Kevin Walsh, Billy Penn Burger, Steve Prentice, Samantha Desper Poole, Chris Duncan, Ritchie Rubini, Olivia Rubini and Tony Cappella; 8 p.m.; $12. The Secret Sisters Christmas Tour—Thursday, December 8. Performing originals and Christmas classics; 8 p.m.; $15 in advance or $18 at the door. Runnin’ Late Holiday Show—Saturday, December 10. Six-piece Wilmington band Runnin’ Late will bring a mix of favorite holiday tunes and original songs; 8 p.m.; $7 in advance or $9 at the door. Cartoon Christmas Trio’s 21st Season with the Wilmington Children’s Chorus—Sunday, December 11 and Sunday, December 18. The classic interpreter of holiday cartoon jazz performs music from classic Christmas cartoons; 7 p.m.; $12. We Kids Rock Band’s Holiday Show—Saturday, December 17. Kids can sing, dance and clap along to catchy originals and traditional holiday favorites in fun musical styles including rock ‘n’ roll, rhythm & blues, punk, ska and country; 11 a.m.; $10.05. Hot Breakfast! And Friends Present: A Very Dorky Christmas—Saturday, December 17. Delaware’s Premier Acoustic Dork Rock Power Duo presents an old-timey holiday show; 8 p.m.; $16. The Peek-A-Boo Revue Holiday Spectacular —Sunday, December 18. Philadelphia’s longest-running burlesque show performs to holiday songs from the Striptease Orchestra; 8 p.m.; $25. Mistletoe Jam 2016—Thursday, December 29. Featuring John Faye & Those Meddling Kids, Soraia, Mach-22, Joey DiTullio Band, Robbie Casablanca, Curtis Jr. and Scarlet Sunrise; 6:30 p.m.; $15 in advance or $18 at the door. New Year’s Eve with the David Bromberg Quintet—Saturday, December 31. Americana godfather David Bromberg performs the blues with his quintet to ring in 2017; 10 p.m.; $60. December 8 & 9. Save 20% storewide and enjoy holiday treats, including free festive photos, 2-6 p.m., hot cocoa and cookies from 4-6 p.m. and free gift wrapping all day. December 8 & 9. In conjunction with the Sale-A-Bration; raffle prizes, refreshments and giveaways; second floor, Bookstore. Tuesday, December 13-Wednesday, December 21. Special savings for Penn and CHOP employees in the Museum gift shop. Entry is free to PennCard holders; the Shop is open during regular Museum hours. Info. : (215) 898-4046. Saturday, December 3. 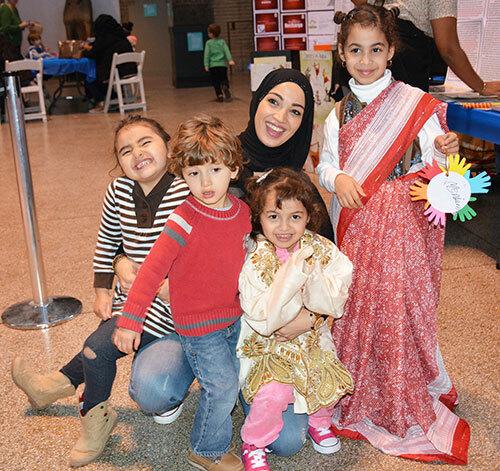 Groups from across the region share their cultural heritage through music and dance performances, craft stations, storytelling and more at Penn Museum; 11 a.m.-4 p.m.; free. Wednesday, December 7. University Club Holiday Party, for Club members and one guest per member; 4-6 p.m. at the Inn at Penn. Thursday, December 8. Hosted by Makuu Black Cultural Center; 6 p.m. in Hall of Flags, Houston Hall. Monday, December 12. Celebrate 10,000 transplants and 50 years of transplantation; 5:30-8 p.m., Smilow Center for Translational Research Commons. RSVP by November 25: (800) 789-7366. Philadelphia is now a World Heritage City, and the Penn Museum offers a free, spirited holiday program with an international focus: Celebrations Around the World on Saturday, December 3 from 11 a.m. to 4 p.m. Guests will receive Museum “passports” to “visit” China, Japan, Kenya, Iraq and the Republic of Georgia and discover a world of holiday traditions throughout the galleries where guests’ passports will be stamped at this annual, all-ages event. Traditional Vietnamese songs as well as world music geared toward children, Tai chi and karate demonstrations, African and African-American storytelling, and “Celebrations Around the World” family gallery tours are all part of the event, along with balloon art, face painting, holiday craft make-and-takes and even holiday cupcakes, while they last! The celebration begins with an inspirational talk at 11:30 a.m., as Thomas Dixon offers a wide-ranging look at “New Year’s Eve Around the World.” A native Pennsylvanian and a Temple University graduate student, his goal, as he explains on https://thehumanist.com/ is to visit a new city every year on New Year’s Eve, opening himself to new cultures, experiences and people. About the Crime Report: Below are all Crimes Against Persons, Property and Crimes Against Society from the campus report for November 7-13, 2016. View prior weeks' reports. —Ed. This summary is prepared by the Division of Public Safety and includes all criminal incidents reported and made known to the University Police Department between the dates of November 7-13, 2016. The University Police actively patrol from Market Street to Baltimore Avenue and from the Schuylkill River to 43rd Street in conjunction with the Philadelphia Police. In this effort to provide you with a thorough and accurate report on public safety concerns, we hope that your increased awareness will lessen the opportunity for crime. For any concerns or suggestions regarding this report, please call the Division of Public Safety at (215) 898-4482. Below are the Crimes Against Persons from the 18th District: 5 incidents with 1 arrest (3 assaults, 1 aggravated assault and 1 domestic assault) were reported between November 7-13, 2016 by the 18th District covering the Schuylkill River to 49th Street & Market Street to Woodland Avenue. As we give thanks for what we have, let us consider sharing some of it with others in our Philadelphia community! Bethesda Project is in need of new or gently used men’s clothing, as well as toiletries. Career Wardrobe is in need of new or gently used women’s business attire, including accessories, shoes and professional handbags. The Penn Professional Staff Assembly will be collecting items to share with these two Philadelphia organizations from now through Thursday, December 8 at several locations across campus. Please join the PPSA on Friday, December 9 from noon-2 p.m. at the School of Nursing to help fold, sort and package the donations. We’ll be serving light refreshments and holiday cheer! This is a summary of the annual report of The University of Pennsylvania Basic Plan (Plan No. 028) sponsored by the University of Pennsylvania, EIN: 23-1352685, for the period January 1, 2015 through December 31, 2015. This annual report has been filed with the Employee Benefits Security Administration, as required under the Employee Retirement Income Security Act of 1974 (ERISA). Benefits under the plan are provided through unallocated insurance contracts and a trust fund. Plan expenses were $17,700,268. These expenses included $6,544 in administrative expenses and $17,693,724 in benefits paid to participants and beneficiaries. A total of 22,407 persons were participants in or beneficiaries of the plan at the end of the plan year. The value of plan assets, after subtracting liabilities of the plan, was $721,672,541 as of December 31, 2015, compared to $687,608,139 as of January 1, 2015. During the plan year the plan experienced an increase in its net assets of $34,064,402. This increase includes net unrealized depreciation in the value of plan assets; that is, the difference between the value of the plan’s assets at the end of the plan year and the value of assets at the beginning of the plan year or the cost of assets acquired during the plan year. The plan had total income of $52,872,440, including employer contributions of $48,464,618, employee rollover contributions of $2,406,847, gains from investments of $1,947,974 and other income of $53,001. This is a summary of the annual report of The University of Pennsylvania Matching Plan (Plan No. 001) sponsored by the University of Pennsylvania, EIN: 23-1352685, for the period January 1, 2015 through December 31, 2015. This annual report has been filed with the Employee Benefits Security Administration, as required under the Employee Retirement Income Security Act of 1974 (ERISA). Benefits under the plan are provided through unallocated insurance contracts and a trust fund. Plan expenses were $165,842,077. These expenses included $31,073 in administrative expenses and $165,811,004 in benefits paid to participants and beneficiaries. A total of 23,963 persons were participants in or beneficiaries of the plan at the end of the plan year. The value of plan assets, after subtracting liabilities of the plan, was $3,814,913,677 as of December 31, 2015, compared to $3,811,200,104 as of January 1, 2015. During the plan year the plan experienced an increase in its net assets of $3,713,573. This increase includes net unrealized depreciation in the value of plan assets; that is, the difference between the value of the plan’s assets at the end of the plan year and the value of assets at the beginning of the plan year or the cost of assets acquired during the plan year. The plan had total income of $169,555,650, including employer contributions of $60,006,555, employee contributions of $63,412,657, employee rollover contributions of $11,472,605, earnings from investments of $33,688,387 and other income of $975,446. This is a summary of the annual report of The Supplemental Retirement Annuity Plan of the University of Pennsylvania (Plan No. 002) sponsored by the University of Pennsylvania, EIN: 23-1352685, for the period January 1, 2015 through December 31, 2015. This annual report has been filed with the Employee Benefits Security Administration, as required under the Employee Retirement Income Security Act of 1974 (ERISA). Benefits under the plan are provided through unallocated insurance contracts and a trust fund. Plan expenses were $32,635,205. These expenses included $9,749 in administrative expenses and $32,625,456 in benefits paid to participants and beneficiaries. A total of 23,723 persons were participants in or beneficiaries of the plan at the end of the plan year. The value of plan assets, after subtracting liabilities of the plan, was $922,588,956 as of December 31, 2015, compared to $900,779,777 as of January 1, 2015. During the plan year the plan experienced an increase in its net assets of $21,809,179. This increase includes net unrealized depreciation in the value of plan assets; that is, the difference between the value of the plan’s assets at the end of the plan year and the value of assets at the beginning of the plan year or the cost of assets acquired during the plan year. The plan had total income of $63,301,781 including employee contributions of $45,747,738, employee rollover contributions of $14,621,745, gains from investments of $2,761,202 and other income of $171,096. This is a summary of the annual report of the University of Pennsylvania Health and Welfare Plan for Retirees and Disabled Employees (Plan No. 530), sponsored by The Trustees of the University of Pennsylvania, EIN 23-1352685 for the period that began on January 1, 2015 and ended on December 31, 2015. The annual report has been filed with the Employee Benefits Security Administration as required under the Employee Retirement Income Security Act of 1974 (ERISA). Please note that not all employees are eligible to participate in the Plan. Please consult your Plan materials for specific eligibility information. Retiree benefits were provided through a combination of self-insured payments from the University’s general assets, payments from a trust fund established to fund retiree benefits, and insurance contracts with third party insurance companies. The Plan has contracts with Aetna Health Inc., Keystone Health Plan East, Amerihealth and Metropolitan Life Insurance Company to pay medical and dental claims incurred under the terms of the contracts. The total premiums paid for the plan year ending December 31, 2015 were $933,764. The value of Plan assets, after subtracting liabilities of the Plan, was $355,132,650 as of December 31, 2015, compared to $352,166,486 as of January 1, 2015. During the plan year the Plan experienced an increase in its net assets of $2,966,164. This increase includes net unrealized depreciation in the value of Plan assets; that is, the difference between the value of the Plan’s assets at the end of the year and the value of assets at the beginning of the year or the cost of assets acquired during the year. The Plan had total income of $23,565,512 including employee contributions of $5,922,260, employer contributions of $28,391,718 and losses from investments of $10,748,466. Plan expenses were $20,599,348. These expenses included $2,853,907 in administrative expenses and $17,745,441 in benefits paid to participants and beneficiaries. The Plan has a contract with Aetna Life Insurance Company to pay life insurance claims incurred under the terms of the contract. The total premiums paid under this contract for the plan year ending December 31, 2015 were $319,658. To obtain a copy of the full annual report, or any part thereof, write to the office of the Plan Administrator, c/o Joanne M. Blythe, Retirement Manager, University of Pennsylvania, 3401 Walnut Street, Suite 527A, Philadelphia, PA 19104-6228, or call (215) 898-9947. The charge to cover copying costs will be $5 for the full annual report or 25 cents per page for any part thereof. You also have the right to receive from the Plan Administrator, on request and at no charge, a statement of the assets and liabilities of the Plan and accompanying notes, or a statement of income and expenses of the plan and accompanying notes, or both. If you request a copy of the full annual report from the Plan Administrator, these two statements and accompanying notes will be included as part of that report. The charge to cover copying costs given above does not include a charge for the copying of these portions of the report because these portions are furnished without charge. You also have the legally protected right under ERISA to examine the annual reports in the offices of the Employer at the address for the Plan Administrator, above, and at the U.S. Department of Labor in Washington, D.C., or to obtain a copy from the U.S. Department of Labor upon payment of copying costs. Requests to the Department should be addressed to: Public Disclosure Room, Room N-1513, Employee Benefits Security Administration, U.S. Department of Labor, 200 Constitution Avenue, N.W., Washington, D.C. 20210. 6. Information regarding pooled separate accounts in which the plan participates. You also have the right to receive from the Plan Administrator, on request and at no charge, a statement of the assets and liabilities of the plan and accompanying notes, or a statement of income and expenses of the plan and accompanying notes, or both for the Plan. If you request a copy of the full annual report from the Plan Administrator, these two statements and accompanying notes will be included as part of that report. The charge to cover copying costs given above does not include a charge for the copying of these portions of the report because these portions are furnished without charge. My college dance history professor took breaks from lecture to perform dances—in costume—from the periods we were studying. That class, although it did not directly relate to my major in geophysics, was vital to my education. My professor understood that others like me may be going into the class with an existing joy for dancing (or not), but it was his job to help us to see dance as an art form that has evolved through time and impacted history. His engaging and creative style moved me to go beyond a simple memorization of the periods of dance and come to more fully appreciate how dance can tell a story, heal, imitate nature and more. Students learned not just when the Académie Royale de Danse was formed, but how dance often mirrors and influences our ideas of gender, style, politics and health—things we cared deeply about. I enjoyed the course, but more importantly it impacted my intellectual growth as an educator. As a scientist, I want my non-science students to say the same for my oceanography course. I cannot put on scuba gear and dive to the bottom of the ocean in front of the class, nor take my students along on an adventure across the Pacific, but I can try to open the doors of science in other ways. I find three things to be very helpful in the process of opening those doors for students of all majors: varying the type of assignments, using multiple methods of teaching and making an effort to connect the course material to the students’ lives. I try to remember that students coming from different disciplines don’t always have the same familiarity or mastery with every type of assignment. One student may learn best from problem-based assignments, while another may thrive by completing an essay assignment. Aiming for some range of different assignments can ensure that students feel they’re able to put their best foot forward on at least some of the assignments, no matter what the content. A friend once told me his favorite thing about his college earth science course was writing a poem for one of the assignments. I initially assumed that he had not taken a very “serious” course. But over the years I have continued to think about what he said, and I find myself adding more creative assignments, even poems (! ), to my course. At the end of an exercise on Climate Change Impacts, Adaptations and Vulnerability the last prompt is, “Now, write a letter to your favorite (or least favorite) politician, diplomat or other notable public figure explaining what the likely climate change impacts are for their state/country.” The last prompt on the Seasons exercise instructs the groups, “In the creative mode of your choice (a letter, a poem, a very detailed picture, a song…), describe why we, on Earth, experience seasons.” I also give students the options to do a video or instructional pamphlet for their final project, as the result of a conversation I had with a student who told me how drawing the processes we discussed in class helped her learn the processes in a deeper way. Using multiple teaching methods, including both lecture and active learning, allows me to more effectively move students toward those higher order learning objectives: applying content to a new problem, analyzing new information, synthesizing material and evaluating a conclusion or solution. For example, I often pair content with activities such as using real data to make a decision about where to put a wave power plant. I use other strategies like “jigsaw activities,” where the class is divided into several groups, each of which is to become expert on one aspect of the material being taught, and after some portion of the activity is completed in the expert groups, all students are redistributed into new groups, where they can share their “expert” knowledge and learn from others before tackling the final portion of the class assignment together. I also have students make predictions or solve problems individually and then share their answers with a student next to them before we discuss an issue as a class (“think-pair-share”). Alternatively, in “gallery walks” students move around the classroom responding to prompts on the board creating a visual guide to that lesson’s concepts that can be summarized and reported to the class as a whole by the students and instructor. I also like to throw in metacognitive activities like “minute papers” or “concept maps,” where students complete tasks—writings and sketches—that require them to think about their own learning process. The material we teach our students is important. We know this, but sometimes it takes being a bit more explicit, or incorporating a creative assignment or activity, to get the point across to our students. We’re told by cognitive scientists that students learn best when they have a context for the new knowledge. For example, Donovan & Bransford (2005, p. 4) write, as part of the Introduction to How Students Learn: History, Mathematics, and Science in the Classroom that, “new understandings are constructed on a foundation of existing understandings and experiences.” This is crucial when emphasizing the importance of addressing preconceptions, but it also reminds us to connect the concepts in our course to those the students already care and know something about. In oceanography, I can build on the political science student’s interest in Conference of the Parties (COP21) when discussing ocean atmosphere dynamics and the greenhouse effect, the engineering student’s knowledge of renewable energy when discussing global tidal patterns and how tidal power plants operate, the history student’s background in 19th century British history when discussing early navigation advances, and so on. What’s the point, and what else helps? I work to make the relevance of my course more obvious and keep students engaged with the methods described above in order to deepen their understanding of Earth and help them acquire the fundamental concepts of science literacy. I want them to learn science so that they will vote intelligently, read the newspaper thoughtfully, make smart investments, appreciate nature and care for our planet. Admittedly, it is challenging to make a lasting, real impact on a student outside their major, but I find it easier when I focus on what I really want my students to learn and repeatedly remind myself and my students of both the oceanographic content objectives (e.g., I can describe the many active geologic processes that occur at plate boundaries and how these shape the bathymetry of the oceans) and science literacy objectives (e.g., I can explain the scientific process and how our understanding of Earth changes through time due to scientific investigations and the increasing availability of more information). While I want my students to learn a lot, it can be overwhelming, and I don’t want to teach a course that’s a mile wide and an inch deep (a criticism I received some years ago and tried to learn from). I want to teach a course that will stick with my students forever, as that dance history class did for me. Jane Dmochowski is a senior lecturer in earth and environmental sciences and the assistant director of the earth and environmental science undergraduate programs in the School of Arts & Sciences. This essay continues the series that began in the fall of 1994 as the joint creation of theCollege of Arts and Sciences, the Center for Teaching and Learning and the Lindback Society for Distinguished Teaching.